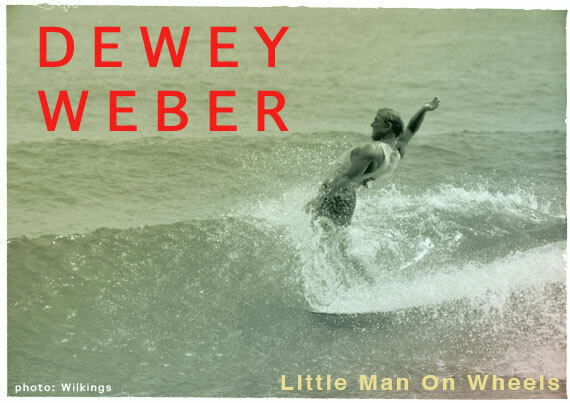 The much-anticipated biography of flamboyant surfing legend Dewey Weber (1938-1993) is the inspiration for an exhibition at Surfing Heritage Foundation. The exhibition, Little Man On Wheels, is curated by Barry Haun and consists of key surfboards (such as the Dewey Weber Performer, the single most produced longboard model in the history of surfing), photographs, illustrations, and other objects that punctuate the development of Dewey Weber as an iconic surfer, millionaire businessman, and tireless industry promoter. The 215-page, fully illustrated book by author Gerald B. Derloshon includes a foreword by 1966 World Champion Nat Young and an introduction by pioneering big wave rider Greg Noll, and photographs by surfing's acclaimed master lensman LeRoy Grannis.